There is a lot to consider when replacing your HVAC system – not the least of which should be the present condition of your duct network. Putting in a new 95% gas furnace is all fine and good, but actually getting the air where you want it to go in an efficient/affordable manner is the real goal. Ducts are like the veins in your body. They of course circulate the air throughout your home. At Hetter Heating & Cooling, we find that most homeowners experience comfort issues in their home because of poor air distribution – meaning leaky ducts, insufficient air flow, poor humidity removal or an inefficient plenum. We address potential duct issues on our FREE in home estimate. (All pictures provided here are recent Hetter installations). Ducts are often overlooked. Leaky ducts can cause health problems and waste the energy savings that new high efficiency HVAC systems promise. Also, if the ducts are too small they will cause the HVAC system to use more energy while delivering less comfort. Ducts that are too small also may lead to early equipment failure. Every major survey that manufacturers and third party entities have done in our industry over the past fifteen years has revealed that leaky ducts can not only contribute to significant loss in energy efficiency but also contribute to reduced comfort as well. Ducts are an integral part of your forced-air system – furnace, heat pump, or central air conditioner. The job of your duct network is to circulate heated or cooled air evenly to every room in your home. Poorly performing ducts that leak conditioned air reduce your system’s efficiency by as much as 20% thereby causing it to work harder to keep your home at a comfortable temperature. Ducts are commonly concealed in walls, ceilings, attics, basements, or crawl spaces, which can make them difficult to access and repair. The EPA recommends using a professional contractor for duct improvements. At Hetter Heating & Cooling, we repair ductwork and offer a FREE assessment with every in-home estimate. Major duct repairs are not a common element of a system upgrade. Small tweaks combined with a newer, more efficient air distribution system can make a major difference in comfort in your home. For tips for selecting the right contractor, go to EnergyStar.gov. Properly installed and maintained duct work can last twenty years or more. But time, heat and humidity can degrade your duct’s insulation. Over the years, your ducts may have collected contaminates that should be removed. Think about it. Have some of the rooms in your home been less comfortable than others? Are some rooms too hot, too cold or both? Hetter Heating & Cooling not only evaluates your existing duct network for efficiency and proper air distribution, but we can offer (for an additional fee) a room-to-room evaluation so as to verify that your duct system is configured to deliver the right amount of air to each room. You won’t get the full benefit of your new heat and/or air conditioning system if your ducts need repairing or replacing. Proper airflow in your home is critical for both comfort and energy savings as we have discussed. Hetter is one of the few local HVAC companies that consistently invests its time & resources attending duct & air flow seminars. We know because we look around and we don’t see our competition. For more information, go to nationalcomfortinstitute.com. In a word — variable speed (two words). If you experience high humidity issues in your home in the summer, we strongly recommend considering installing a new variable speed furnace (your air distribution system). The blower on your furnace is not only responsible for pushing the conditioned air through out your home year-round, but it is also responsible for removing the old stale air from your home. Your furnace’s blower, in essence, is pushing and pulling for your comfort constantly. Unfortunately a non-variable speed blower is limited in the comfort it can offer you. Variable speed, on the other hand, by far pulls out more humidity in the summer than any other blower. Trane offers a couple different variable speed options (see Heating page). 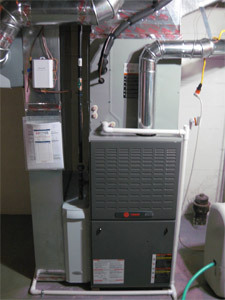 Your plenum – which is the area directly above your furnace – is probably the most critical part of your duct network. If this area is inefficient and not addressed during the installation of a new system, both your comfort and your wallet will feel it. At Hetter Heating & Cooling we take plenums seriously. While most of our competition will either skip or overlook any upgrades needed in this area, we have made it a specific & prominent part of our line item checklist. Not all plenums need to be addressed. In fact, most can fit nicely to your new system. 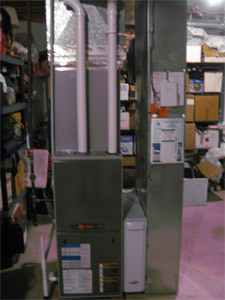 Typically older furnaces – those that are over 25 years old – may very well have a plenum that needs to be re-worked. Note the tight, sleek and nicely sealed plenums pictured. Air goes the path of least resistance. If a plenum is left over sized when a change-out occurs (new furnace installation), you run the risk of not getting the necessary air to problem areas through out your house. Over sized plenums can reduce air velocity, contribute to poor aerodynamics, and even perpetuate a very wasteful phenomenon called "churning". Tight plenums — like those pictured — not only ensure your system will operate more efficiently, but aesthetically they look so much better. A FREE visual inspection (including any recommendations to improve airflow / comfort / efficiency) of your existing duct network with an estimate to replace your HVAC equipment. A FREE Heat Loss Heat Gain Load Calculation (to determine correctly sized equipment for your home) with an estimate to replace your HVAC equipment. Room-to-room Heat Loss Heat Gain Load Calculation (for a additional fee) to determine precise air flow volume needed throughout the home — particularly to problem rooms. Seasoned technicians to accurately diagnose airflow issues. Static pressure test (with installation). Airflow test (for additional fee with room-to-room). Seal plenum (with furnace and/or system installation) with mastic, metal tape. 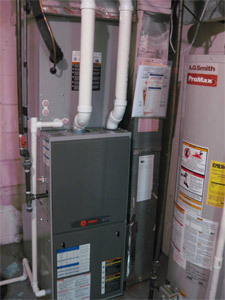 Balance duct system (with furnace and/or system installation). For more information and a copy of ENERGY STAR’s “Duct Sealing” brochure, visit www.EnergyStar.gov/ducts. If you don’t remember the last time you have had them cleaned, it’s probably time. You would be surprised what your duct network can attract. For a thorough whole house duct cleaning, we recommend contacting an NADCA (National Air Duct Cleaning Association) member. Your air grilles and supply air registers play an important role in providing heating and air conditioning comfort. There are times when simply replacing one or more of these devices can cause a noticeable improvement in your home’s thermal comfort. Return grilles that are undersized can reduce the efficiency of your air conditioning system as well as the comfort in your home. Hetter Heating & Cooling will perform a visual inspection to verify that these devices are sized and operating properly and WILL make suggestions (when necessary) for improved performance. The information on this page was compiled with help from the following sources: ACCA’s Consumer Education series, EnergyStar.gov, NationalComfortInstitute.com.